Davidson-Pilon, C. Bayesian methods for hackers: probabilistic programming and Bayesian inference. (Addison-Wesley, 2016). 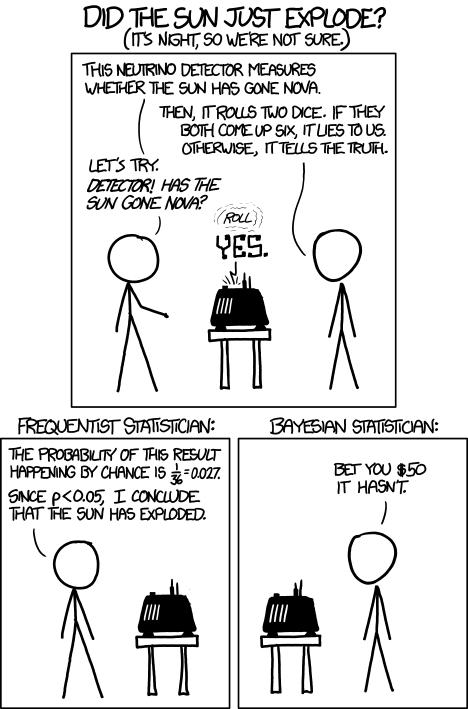 Kruschke, J. K. Doing Bayesian data analysis: a tutorial with R, JAGS, and Stan. (Academic Press, 2015). Pfeffer, A. 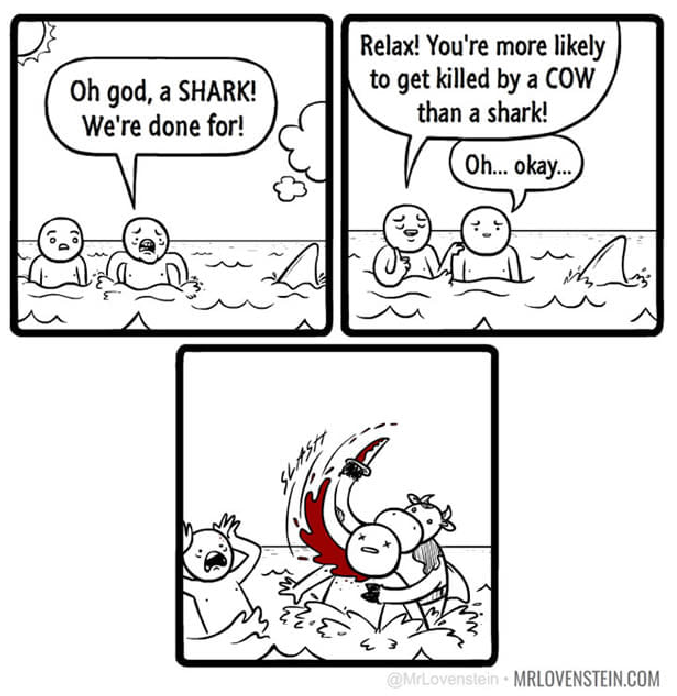 Practical probabilistic programming. (Manning Publications, Co, 2016). Pfeffer 2016: "Probabilistic programming is a way to create systems that help us make decisions in the face of uncertainty." A rare disease is present in one out of one hundred thousand people. A test gives the correct diagnosis 99.9% of the time. What is the probability that a person that tests positive has the disease? 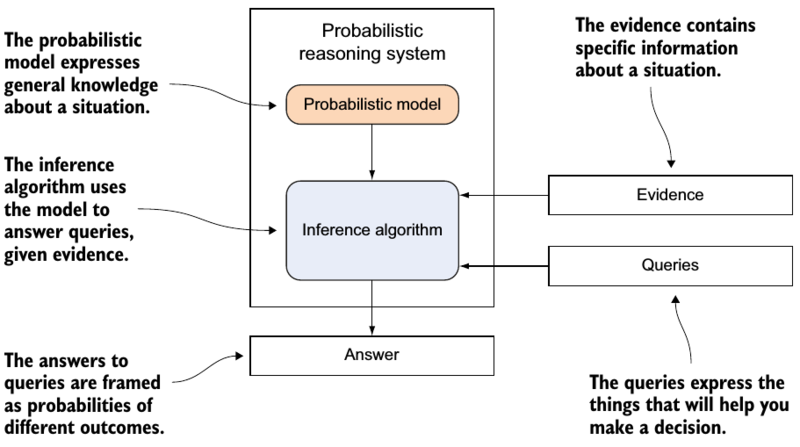 Conditional probability is the probability that one event will happen, given that another event has occured. Bayes' theorem shows how to get from $P(B\ |\ A)$ to $P(A\ |\ B)$. 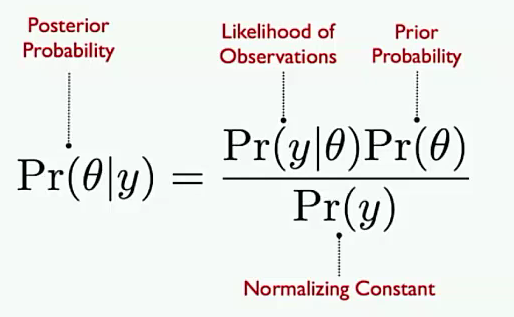 Bayes' Theorem follows directly from the definition of conditional probability. Dividing by $P(B)$ yields Bayes' theorem. Each component of Bayes' Theorem has a name. The posterior distribution is equal to the joint distribution divided by the marginal distribution of the evidence. The first step below follows from Bayes' theorem, the second step follows from the law of total probability. e.g. : what is the probability that the true value is bigger than some value of interest? Sequence of updating posterior probabilities as we observe increasing amounts of data (coin flips). How does our inference changes as we observe more and more data? Davidson-Pilon, C. Bayesian Methods for Hackers: Probabilistic Programming and Bayesian Inference. (Addison-Wesley Professional, 2015). # For the already prepared, I'm using Binomial's conj. prior. for latent variables, the posterior distributions → results are not values but probability distributions! Uses NumPy and Theano for fast numerical computation. Creates posterior summaries including tables and plots. Several convergence diagnostics and goodness-of-fit procedures are available. Extensible: easily incorporates custom MCMC algorithms and unusual probability distributions. !! very efficient fast automatic symbolic differentiation → fast automatic gradients! stochastic variables are variables that are not deterministic, i.e., even if you knew all the values of the variables' parameters and components, it would still be random. Included in this category are instances of classes Poisson, DiscreteUniform, and Exponential. 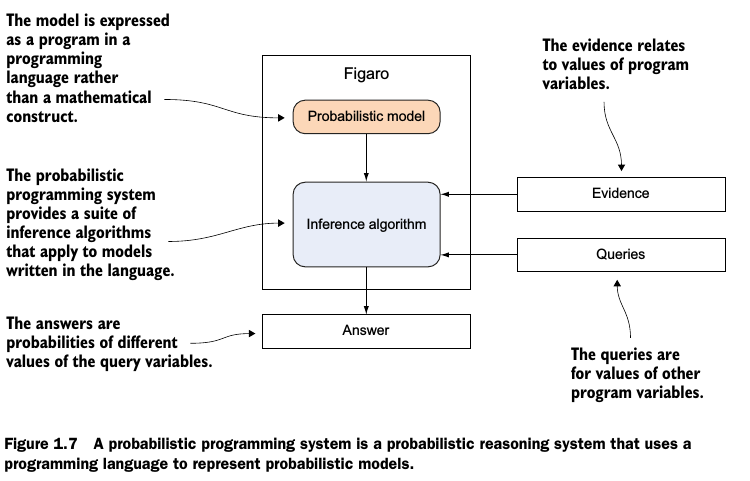 deterministic variables are variables that are not random if the variables' parameters and components were known. This might be confusing at first: a quick mental check is if I knew all of variable foo's component variables, I could determine what foo's value is. Load PyMC3 and generate a new model object. All variables in the new model are defined within its context. Variables defined in a model automatically get an initial test-value. It is used as starting point for sampling in case no other leverage point is defined. To introduce model definition, fitting and posterior analysis, we first consider a simple Bayesian linear regression model with normal priors for the parameters. We choose zero-mean normal priors with variance of 100 for both regression coefficients, which corresponds to weak information regarding the true parameter values. We choose a half-normal distribution (normal distribution bounded at zero) as the prior for $\sigma$. a simulation-based approach such as Markov chain Monte Carlo (MCMC) can be used to obtain a Markov chain of values that, given the satisfaction of certain conditions, are indistinguishable from samples from the posterior distribution. Generalized Linear Models (GLMs) are a class of flexible models that are widely used to estimate regression relationships between a single outcome variable and one or multiple predictors. Because these models are so common, PyMC3 offers a glm submodule that allows flexible creation of various GLMs with an intuitive R-like syntax. # and all its parameters are automatically added to our model. Gelman et al. 's (2007) radon dataset is a classic for hierarchical modeling. In this dataset the amount of the radioactive gas radon has been measured among different households in all county's of several states. Radon gas is known to be the highest cause of lung cancer in non-smokers. It is believed to be more strongly present in households containing a basement and to differ in amount present among types of soil. Here we'll investigate this differences and try to make predictions of radonlevels in different county's based on the county itself and the presence of a basement. In this example we'll look at Minnesota, a state that contains 85 county's in which different measurements are taken, ranging from 2 till 80 measurements per county.